Just like last year, I am taking December off from working on Poor Thing. For almost whole year I have been tinkering with it daily and it is making my head spin a little. Furthermore, after nearly nobody bothered to play the Grey Nether I felt more than a little disheartened and making games has taken a backseat to other activities for now. I want to recharge my batteries a little, gain perspective and some new ideas. And I promise to get back to it come 2016, and really push things forward. 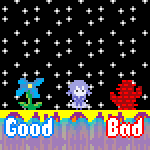 And maybe by the end of next year I will have something wobbly and brittle to show off, a demo of sorts. Poor Thing Update: A Video! This time I do not have screenshots from Poor Thing to share with you. I have something better! A video presenting it in action! I think it starts to look good, but judge for yourselves. My video editing tool did something horrible with compression, but you can still see what the game is about. I tried to present the things I am most proud of: the Merry Berry minihotel, scrolling levels, floor tiles adjusting to scrolling, some shadows and 3d grass (only in the 1st level but will be implemented overall). I hope you like it! I work on it nearly every day and had a sleepless night sometime ago when I put a lot of things together so I have the backstory also more advanced. Ok, enough, enjoy, and tell me hwat you think! A much-needed change of pace and atmosphere here on my end, I have just published an animated video, all animations made in Klik N Play, for my lo-fi casio punk song. It is nonsense but funny at times I think. Enjoy! And if you like my music I have 54 albums available for download / purchase, links are in the video description. I have been working on Poor Thing almost every day for five months. Recently I had a bit of a breakdown and I cannot bringmyself to start working on it again, but I will, don't worry, small steps. It is just overwhelming. But I want to finish it. But it just gets bleaker and more depressing, the game I mean. So stepping away for a bit but instead I complete the backstory and work on the plot and these things are actually progressing. I've been working on my music more recently and I am also making a music video on KnP, I will post it when I'm done. There are many new levels added but it is all a secret and I cannot show you the secret levels. As you may have seen I have been screaming for help lately. The situation is under control - my game works in Multimedia Fusion, which means I will be able to export it in a version suitable for 64 bit platforms. So, after a short panic, time to get back to work! Since the beginning of 2015 I have been working on "Poor Thing" about 4 days a week. So you can imagine things are gaining steam again! Many new places, including a secret location I am not authorized to provide screenshots of. Some spooky figures, unnatural goings-on and looots of new ideas! I attach some places and also a comparison shot of an interior - before and after some redecorating, the second being the level of detail that I mean to implement everywhere else. I think I am going to continue making the game in KNP because I am so used to it, and animating stuff in MMF makes me rip my hair out! And from time to time I will port it to MMF to see if everything is compatible (for some reason certain things go crazy when ported from KNP to MMF, mainly things anchored to other things). I am also writing a "script" of sorts, as in movie, not as in coding, to keep track of all action in right order and logic. And I made a handy map to see what goes where and what corners are missing. So in other words, full speed ahead! All the best to you and I will let you know what's up in another 3 months or so! I am making "Poor Thing" on a Windows XP system and have never tried to run it anywhere else. Apparently no new windows will be able to run a 16-bit program. Will there be no way for anyone to play my upcoming game made with KnP, unless they are running a virtual windows machine? So this will probably result in a collective facepalm from all of you in the know but...is there any way to make my game compatible with 64 bit systems? Even if it would mean porting and transferring parts of the game to another program. Would that be possible at all or is the only possibility making it from scratch in, say, Clickteam Fusion or something like that? Help me, I know you are smarter than I am...Right now I do not see much point in making something so gigantic if hardly anyone will be able to play it in their os.